Duangrit Bunnag Architect Limited (DBALP) has unveiled an eye-catching design for a new airport terminal in Bangkok that features intricate wooden detailing and an indoor forest. The new building is reportedly expected to be operational in 2025. Details are still rather thin on the ground at this early stage, but assuming all goes well, the Suvarnabhumi International Passenger Terminal II will provide an additional 348,000 sq m (3.7 million sq ft) of floorspace to Bangkok's Suvarnabhumi Airport. 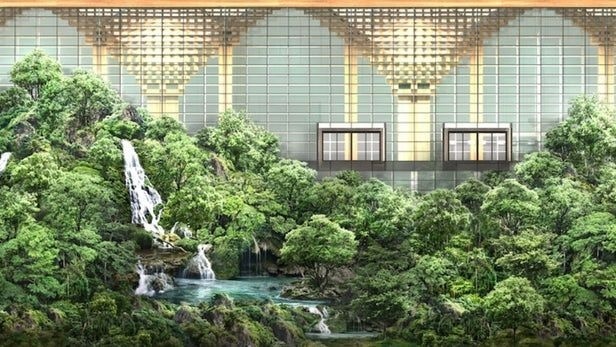 Its most interesting indoor feature is a large 16,132 sq m (173,643 sq ft) tropical forest, which is meant to reflect Thailand's lush landscape and will include a waterfall. The tropical forest area will be accessible to both staff and passengers, and should make for a pleasant spot to escape the bustle of the busy airport.